I was at the Apple Store on 4th Street in Berkeley the day it opened this past August. I’m glad I decided to go. Coming just a few weeks before Steve Jobs’ death, that Store on that day represents about as perfect a tribute to Steve Jobs as I can imagine. I was handed a box as I walked through the Store’s door. The box contained the “4th Street” variation of the t-shirts that Apple hands out to first-arriving customers at all of its Store openings. The sparsely-designed black shirt was pretty much what I expected. What impressed me much more was the box that the shirt came in. It was a work of art—designed with Apple’s laser-like focus on simplicity and elegance. The box’s exterior is all white. A small piece of silver tape, with an Apple logo, is the only identifying mark. The box doesn’t exactly “open.” Rather, like a Japanese origami, it unfolds to reveal its silver interior. When fully expanded, you see a nearly symmetrical single piece of construction with a small white Apple logo at its center. Push on the creases and the box almost automatically folds back into place. You can’t help but smile when you hold it. How many other companies pay this much attention to such fine-grained details? Zero. 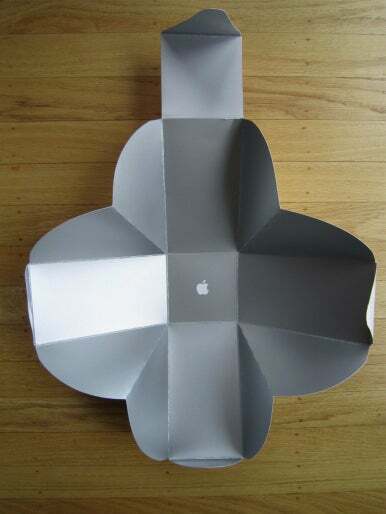 The inside of Apple’s t-shirt “origami” box. Steve Jobs may not have directly overseen the design of the t-shirt box or the front of the 4th Street Store. But I would not be surprised if he did. Either way, it is Steve’s influence that stands behind these creations. Of course, this attention to design extends far beyond t-shirts and sidewalks. Thanks to Steve Jobs, it reaches into everything that Apple does. How Apple’s hardware and software looked, how they “felt”, how they worked, how users “connected” with them—these were all just as important to Steve Jobs as what the products actually did. The next time you stop to watch an iPad commercial or admire the sleek lines of a MacBook Air or marvel at the multi-touch gestures on an iPhone or simply stand in front of an Apple Store, you are witnessing the influence of Steve Jobs. Enjoy it. And pause for a moment to contemplate how different—and inferior—our digital devices would be today if Steve had not come along to shake things up.